Shipping included on orders within the US 48 contiguous states totalling $35.00 or more. Each one was lovingly brought to the surface of legend and myth to ultimately take their rightfully earned place in reality, as folk lore history. Their pout is as natural as the uneven texture of the cork they are created from. Almost always looking to the side, their allure is elusive. They are beautifully exotic. 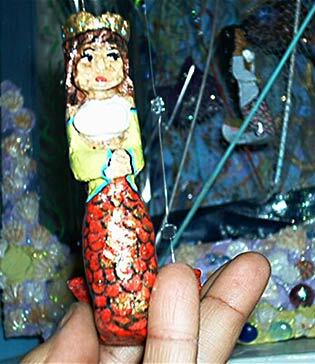 They naturally shy away as if in flight, reminding all of us of the many stories about mermaids. Mermaids that were somehow out of the reach of mortal man. Sailors claimed that they had seen their voluptuous bodies lying on shores. Had these courageous and adventurous men indeed seen beautiful women with a woman's upper torso and the body of a fish? Or had they in fact seen a vision of a silky siren as an illusion, in a great walrus? Who knows. There are many tales about mermaids and mermen and their existence throughout history. What story would you believe? Hang them by a fan or in a breeze, they will do their wind-dance for you. For the folk art collector that thinks they have everything. © Shay Jones 2003. All intelectual property (words and images) on this site is copyright protected and owned by Shay Jones. Any use without permission will be tracked and prosecuted to the full extent of the law.